Great Snapchat Art Direction begins with developing a solid understanding of the platform's key features & editing tools. Start with the basic setup, take a look at some of our favourite tools in action, then try them for yourself! You can also download our Free Snap Creation Templates and make Art Direction for Snap even easier. ‍Make sure you consider the orientation of your shots at the planning phase, and try to keep all shots in a story on the same orientation. ‍Your audience doesn't have long to take it all in, so avoid cramming too much into each frame, and alter the display time on your Snaps (from 1-10 seconds) accordingly. ‍Same deal with text - keep it light, and if you need more room for copy, split this across multiple frames. ‍Perhaps Snapchat's most distinguishing characteristic is its emphasis on creating a narrative across multiple frames, rather than standalone bits of content. ‍You might consider designing a Bitmoji for your branded Snapchat account and use it to host or introduce stories - much like a mascot. Noticed some snazzy location-specific frames on your friends' stories? They're probably using Geofilters. This feature is a great way to give your Snaps situational context or add visual interest. And with On-demand Geofilters, you can even create your own. ‍Use On-demand Geofilters (in your brand's colours and style) at key events to give Stories more polish and make your message go further. Visit Snap's website for more info. 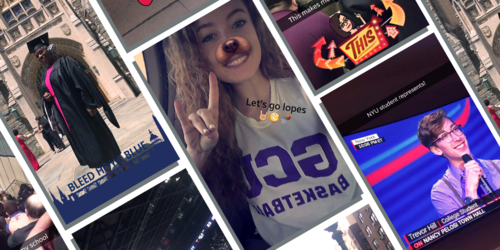 Lenses are one of Snapchat's most iconic features, and instantly add Snap flavour to Stories. There are two types: World Lenses (like the one pictured) and Selfie Lenses. Once you've mastered the steps to using World Lenses, simply tap the camera icon top-right of your screen to switch view, then repeat the same process to try out Selfie Lenses. ‍Use Selfie Lenses and World Lenses to transform your world & regular characters into a surreal Snapchat playground. This lends a distinct Snapchat aesthetic to content, and adds visual interest to your Stories. These are another great way of making Snaps pop - and they're super easy to use. Follow the steps to the left and you'll be a master in no time. ‍Use the 'Scissors' tool to create a set of bespoke branded Stickers. This tool is located top-right of your screen, next to the Sticker button. Simply click the Scissors and use your finger to 'cut out' different parts of the image. They'll then become Stickers you can apply to other Snaps. So, you've got the basics covered. Now it’s time to develop your own look & feel for Stories. Having a simple yet distinctive aesthetic helps set your content apart from other brands, makes Snaps easier to create, and strengthens your Storytelling. One way to go about this exercise is to imagine a continuum with your brand at one end and Snapchat’s features at the other. The sweet spot is in the middle: Recognizably your brand, but distinctively Snapchat, too!